All magazines vary. Check out all my other magazines. 12 easyriders. 3 easyriders anniversary. Raised gold toned eagle on silver colored shield. 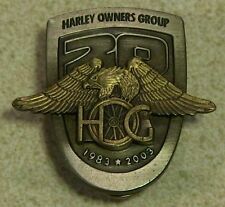 Also coincided with Harley Davidsons 100th anniversary. 20th H.O.G. 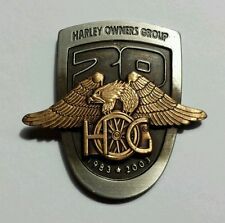 Anniversary Pin 1983-2003. 100th Harley Davidson Anniversary. BIG 11 X 14 INCHES. JAY SPRINGSTEEN RACING ON HIS XR-750 HARLEY DAVIDSON MOTORCYCLE IN 1983. This would be a fantastic addition to your collection! It is a reproduction 11 X 14 Inch glossy photo. A high quality photo. You will love it! Jay Springsteen is considered one of the best AMA Grand National flat-track racers of all time. Bursting onto the scene and earning the AMA Rookie of the Year Award in 1975, Springsteen won three consecutive AMA Grand National Championships starting in 1976. In 1982 he became the first rider to reach 30 wins in AMA Grand National competition. A NEAR MINT COPY OF THE NOVEMBER 1983 EASY RIDERS MAGAZINE. JAY SPRINGSTEEN RACING ON HIS XR-750 HARLEY DAVIDSON MOTORCYCLE IN 1983. This would be a fantastic addition to your collection! It is a reproduction 8 x 10 inch glossy photo. A high quality photo. You will love it! Jay Springsteen is considered one of the best AMA Grand National flat-track racers of all time. Bursting onto the scene and earning the AMA Rookie of the Year Award in 1975, Springsteen won three consecutive AMA Grand National Championships starting in 1976. In 1982 he became the first rider to reach 30 wins in AMA Grand National competition. A NEAR MINT COPY OF THE AUGUST 1983 EASY RIDERS MAGAZINE. ~ WE HAVE LISTED HUNDREDS OF MOTORCYCLE MAGAZINES ~. Great Jack Knight Special Vincent Centerfold in perfect condition. Super Cycle September 1983. Cycle July 1983. Starring Suzuki's GS550ES Lightning Bolt. GS 400-450 twins 1977-1983 service repair performance manual.